One of the niceties of owning a smartphone is the huge amount of apps available for download, many of which games. Some time ago, one of these games which was keeping me occupied was SliceIt! from Com2uS. Don’t worry if you don’t know the game or haven’t played it, I’ll quickly explain it below. A typical SliceIt! level. 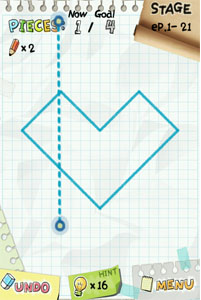 Players draw lines (as shown here) to split a given shape into equally sized areas. The goal of the game is to draw a number of lines to divide (“slice”) the given area into a number of pieces. Both the number of lines and required pieces are fixed and given beforehand. You have to use all the strokes given, and have to match exactly the number of needed pieces. No more, no less. The final requirement of the game is that the resulting pieces need to have about the same area. While their form may differ, their area (size) has to match. This means for example that if the goal is to get four pieces, all these four pieces need to have a size around 25% (100%/4) of the original area. Pieces don’t have to be of exactly the same size. If their areas differ slightly, the level is still won. This allows for levels which have straightforward but not-quite-perfect solutions and perfect but hard-to-find solutions as well. This solution would use 5 lines to form 10 equal areas, but the red areas forbids the player to draw the final line. And finally, the solutions can be easily checked (just compare areas with a known goal). And so I set out to test this theory as a weekend project. Levels are created by defining a number of polygons. A level can be build out of multiple shapes. These polygons can both be convex and concave. The polygons can contain holes as well (not sure if there are levels like this in the game). Polygons can be added to a level which denote “forbidden areas”, though which no lines may be drawn. Feature number three is the most challenging one. 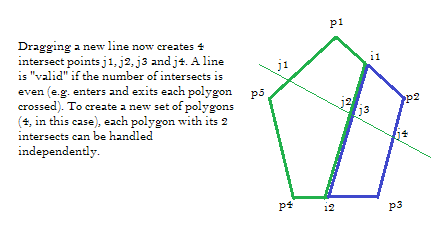 To solve this, you have to first create a polygon defining the outermost shape, and then additional polygons to define the holes. The area of the obtained shape is then calculated by subtracting the areas of all holes from the areas of all the outer shapes. While I was planning to implement this add first, I dropped it, mainly out of laziness, and because much of the logic in the game would’ve become quite harder when this aspect would be included. A point: constructed out of two numbers (x and y coordinates). A line: constructed out of two points (point one and two). 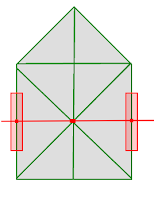 A polygon: constructed out of an array of lines (the edges). A rectangle: constructed out of two points (upper left and lower right corner). For area (and centroid): http://en.wikipedia.org/wiki/Polygon#Area_and_centroid, I used the shoelace/surveyor method (http://en.wikipedia.org/wiki/Shoelace_formula). The drawer: contains methods to draw various things using a surface. These contain methods for drawing the level, the forbidden rectangles, and a cutting line when a player drags the mouse. The level: contains level data, such as the number of allowed strokes and required pieces. The definition of the polygons making up the level, and the list of rectangles defining the forbidden areas. The level object type also contains some methods for handling the harder game logic. 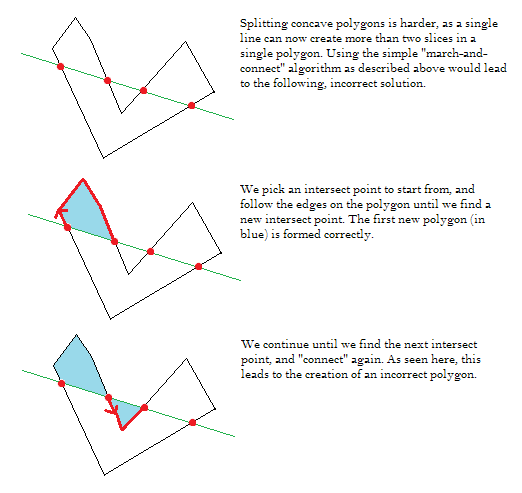 E.g., methods which take a line, and figure out how the current list of level polygons should be cut. The way levels are cut after drawing a line works like this. First, compare the drawn line with all the edges defined by all the polygons to get a list of intersects. Then, some basic checking is performed to figure out if the line is valid. Finally, if the line is valid, polygons are split up, and a list of new polygons is created. 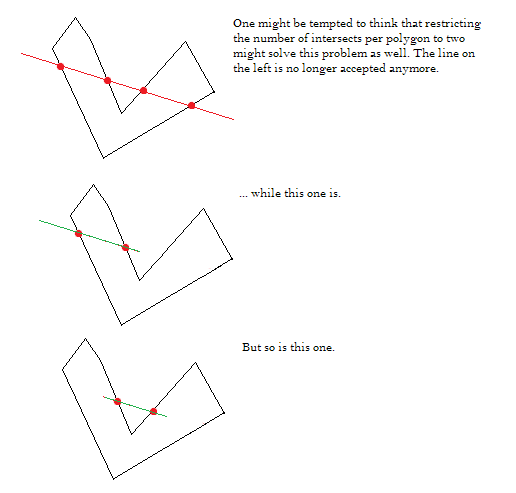 To solve this problem, we should either adapt our method in order to “clip” the drawn line with the given polygon. Instead of doing so, I opted to work with convex levels only. So convex-only levels for now. If someone wants to hack in support for complex polygons (concave and/or holes): links to the code will be posted at the end. The last thing which was added were methods to check if a level is solved correctly.To avoid that the player has to have ultra-precise eye-hand coordination, very small polygons (e.g. less than one percent of the original area of the level) created by drawn lines are disregarded when checking the areas and number of goal areas. Now that the game was playable, I converted the level which was giving me difficulties to coordinates, and started working on the genetic algorithm. To implement the genetic algorithm, I used the “Mona Lisa”-painting genetic algorithm by Nihilogic as a starting point. This algorithm implements a simple tournament-based genetic algorithm. As said earlier, each population member can be represented as a fixed size array of points denoting the position of the lines. Crossover is easy as well, as we can just take one half of the array defined by parent number one, and combine it with the second half of the array defined by parent number two. I say “half”, but it’s not necessary to split the two arrays neatly in half; the crossover point can be randomly chosen. Mutation works similarly. When the decision is made to mutate a member of the population, each point is randomly moved to a new position. The algorithm and Canvas/JS implementation of SliceIt! can be tested here. If you run the genetic algorithm (click “Evolve”), you’ll notice that, although sometimes a valid solution is found, the algorithm has a tendency to get stuck in a local optimum (e.g. where only four of the required five lines are drawn). The reason for this is something we haven’t yet talked about: the fitness function. The sizes of the areas created. The number of areas created. The number of valid lines drawn. Using this function alone, however, often leads to the algorithm getting stuck in local optima. Therefore, we need to punish for missing lines/areas as well. The problem is finding a function which drives the algorithm towards adding/moving a line when it is invalid, while still remaining able to “escape” local optima by making a line or the number of areas temporarily invalid. I’ve tried different fitness functions, but none of them seem to be particularly efficient (feel free to modify the code in “Candidate.prototype.calcFitness”, I’ve left the code uncompressed). As an extra exercise, I rewrote a very basic version of the algorithm using Java. To implement the genetic algorithm, I opted to give the excellent, thorough Watchmaker library a go. This version works a bit better, mainly since there are no “forbidden areas” and the mutation operators are a bit more fine-tuned. See the suggestions below for more ideas if you want to try this experiment yourself. Despite fact that the result works less perfect than expected, this still was a fun weekend-project. This project was a good exercise emphasizing the importance of a good fitness function when dealing with genetic algorithms. Programming a project like this one is somewhat easier in Java. The Watchmaker library especially seems like an amazingly engineered piece of software; I’ll certainly revisit it later. Try implementing complex polygons (i.e. concave polygons or polygons with holes in a robust manner). This is something I’d like to come back to later, as the current implementation bugs me. For the initial construction of the population in the genetic algorithm, several techniques can be used. The one I use here just randomly draws lines, with no regard if they’re valid of not. An alternative technique could opt to only start from valid lines (by requiring that lines stay outside the given starting shapes, for example). For the mutation operators, I just move the points of lines to new random locations. The Java version is a bit smarter and moves points slightly to a neighboring position. Additionally, another “mutator” (with a lower mutation chance) is added which completely creates a new solution. Try making the algorithm “smarter” in this manner. The current version has no regard for symmetry, while human players will often prefer symmetric solutions. Try to find a way to determine and score this aspect. Finally, try coming up with better-performing fitness functions. Just using the squared sum of differences might work, provided you leave enough freedom to search for non-local solutions (e.g. high population size, enough chance for mutations). The way crossover (offspring generation) is performed doesn’t seem to matter much, given the simple solution structure. Changing the population members’ format could work as well, e.g. allow members to contain more lines than the goal number (n) given, but only evaluate the first valid n lines. This allows members to “carry” with them some genetic variety for more generations.